I just loooove biscuits. My dad used to make them as part of a whole Fried Chicken Dinner kind of thing, with cream gravy and the whole nine. Yummmm. I like to have them for breakfast with eggs, or just as a snack with butter and honey. 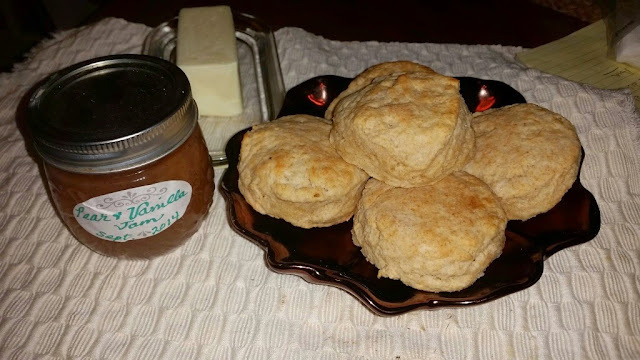 Here I have them with my momma's homemade Pear-Vanilla Jam. I've tried making a few different kinds, like fluffy sweet drop biscuits, but I really wanted to find a recipe that would be simple and make nice flaky ones. A few years ago, looking for recipes using whole wheat, I found this recipe from Danny Boome on the Food Network site, and it's been my go-to ever since. I'll flesh out the directions a bit more for you, though. 1. Preheat the oven to 450 degrees. Get out some kind of baking pan, preferably one with sides. A cookie sheet is fine if that's all you have. No need to grease it. 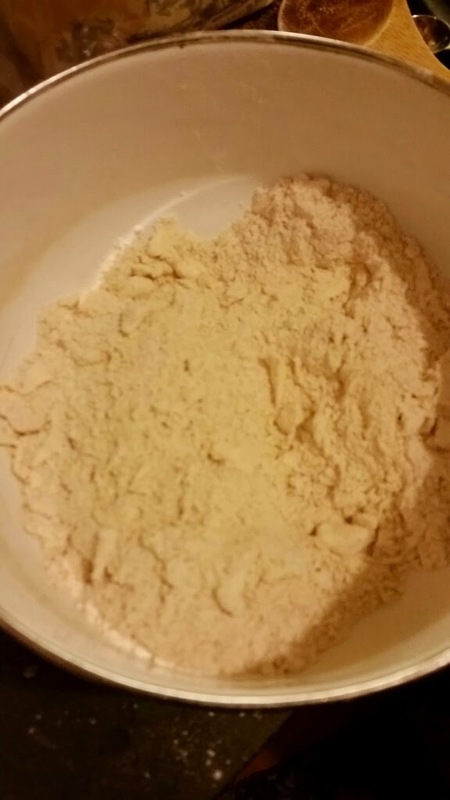 1 cup all-purpose flour, 1 Tbsp baking powder, 1/2 tsp baking soda, 1/2 tsp fine salt, and 2 tsp granulated sugar with a fork, a spoon, or a whisk. Notes: I prefer half AP flour and half regular whole wheat, but today I was out of regular whole wheat and used white whole wheat. It's different but also delicious. Also, if your baking powder or baking soda has expired, or it hasn't but you know you've had it for a while, it's time to get a new one. 3. 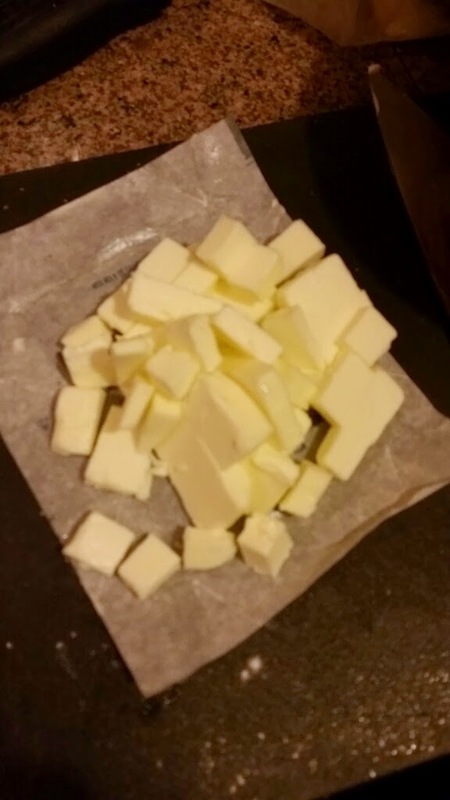 Take, straight from the fridge, one stick of butter (1/4 lb). You don't want soft butter for biscuits, you want it nice and cold. Cut it into very small pieces like the ones in the front here. 4. 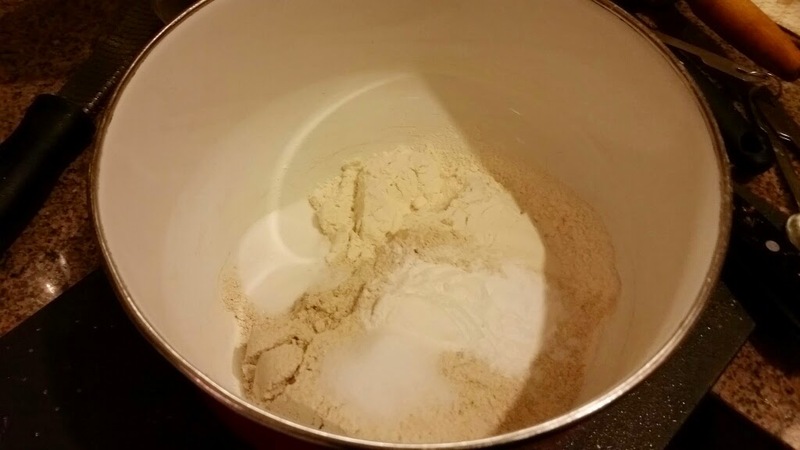 When you're new to baking, the next step of working the butter into the flour mix "until it resembles coarse meal" can be confusing. 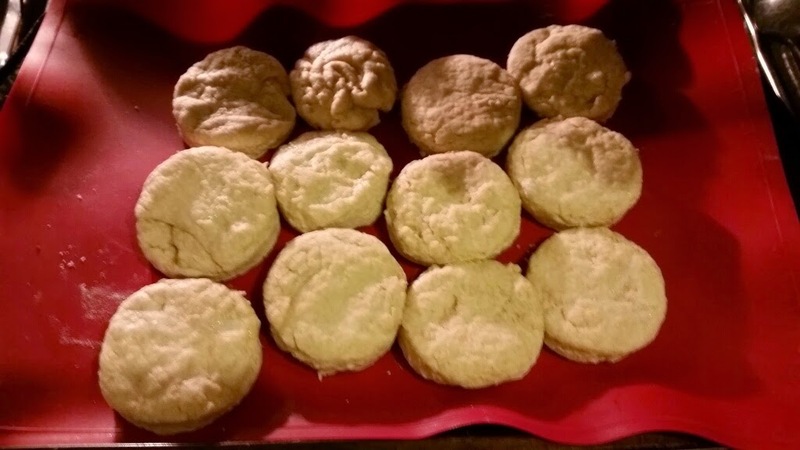 It took me several tries with pie crust recipes to get the hang of it. You can use a pastry cutter, a pair of knives, or your fingers for this. I like to use my (clean) fingers. 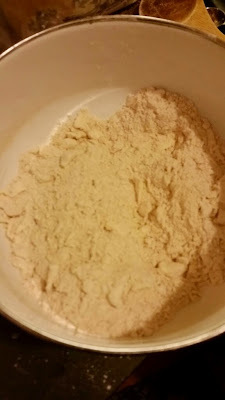 Basically, you work the butter into the flour until the color changes slightly and it looks more like sand than flour. There should still be some slightly bigger pieces of butter--these will create the flakiness you want. If this takes you more than a couple of minutes, put it back in the fridge for a little bit to chill it again. 5. With a fork or a wooden spoon, blend in 1 cup of COLD buttermilk until the dough just comes together. Don't overmix. It looks like I overpoured the buttermilk by a hair this time. It was fine. 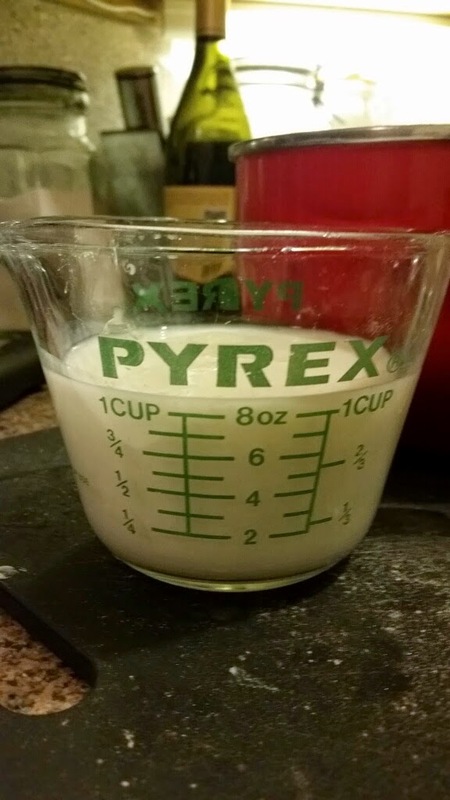 If you only have a dry measuring cup and not a liquid measuring cup, it'll also be OK. If you forgot to buy buttermilk and only have regular milk, use just a little less than a cup, maybe 3/4 plus a splash. I haven't tried any milk substitutes. 6. 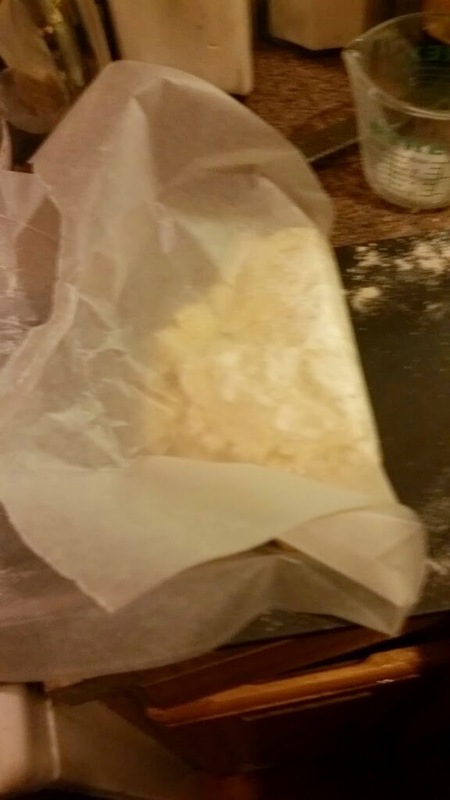 When it just comes together, turn out the dough onto a lightly floured piece of waxed or parchment paper, whichever is on sale at the market. Turning it out onto a cutting board is also good. 7. 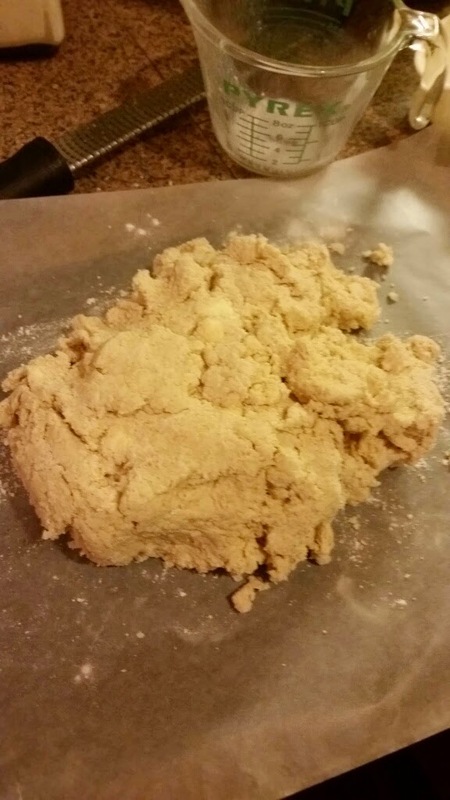 Lightly knead the dough by folding it over onto itself a few times and pushing down. The paper helps with this process. Sprinkle a little more flour on it if it sticks. 8. Pat the dough out into a rectangle about 1 inch thick. You can use a rolling pin or your fingers, just try to make sure it's an even thickness. 9. 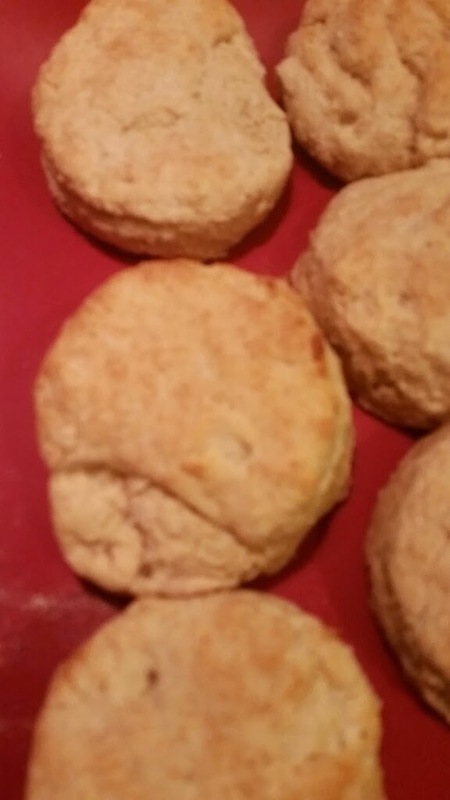 Cut the biscuits. My dad used to use an old frozen juice concentrate can or a glass with straight edges for this. I have a set of metal rings that are essentially biscuit cutters without the little handle thingies. I used a 3" one, but you can use whatever 2" to 4" circle you have. 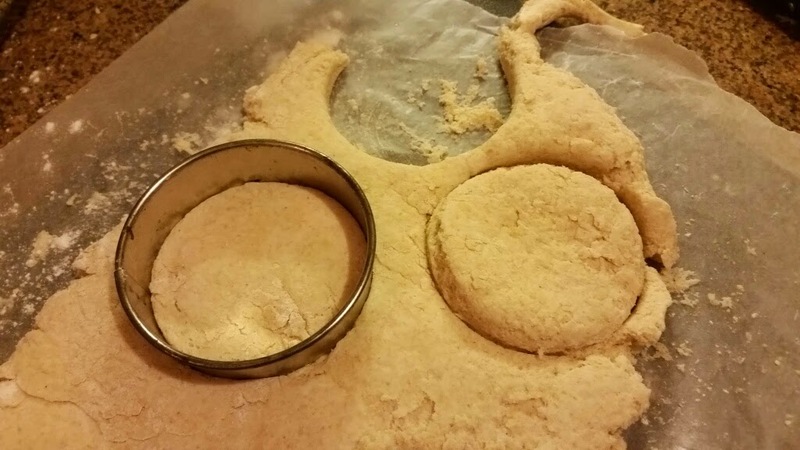 Roll the strips of dough from between the circles into another rectangle and cut out the rest. I got exactly 12 this time, but you might get more or less depending on how thick you patted out the dough and which size ring you use. Then put the biscuits next to each other, directly onto the pan or onto a silicone thingy like I have here, again for ease of cleaning. Putting them next to each other helps them to rise, due to some chemical reaction that eludes me. 10. Into the oven they go, for 12-16 minutes. Start checking at about 10 minutes if your oven runs hot or if you don't know if your oven runs hot. 11. Pull them out of the oven when they look like a little browner than this. I was tired, so I decided this was fine :-) Let cool for a few minutes and serve warm. If you have leftovers, you can put them in the fridge and microwave them for about 10 seconds to heat up (for the next day or two). I, too, have fond memories of childhood biscuits. I may have to give these a try!